There is no doubt that people are resourceful and this is proven every day in every aspect of our life. A recent innovative taxi service was recently introduced in the streets of Amsterdam and it saves energy, reduces CO2 emissions and saves time to the people using it. The story is about the new Green Scooter taxi service! 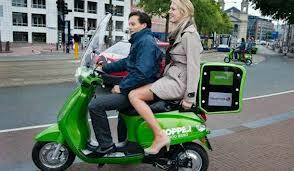 A Dutch company called Hopper has recently introduced a new green taxi service but not using cars or even electric cars! They use electric scooters! This innovative new green taxi service has been recently introduced in the streets of Amsterdam in Holland. There have been a few innovations around the green taxi idea but all them were using cars, small regular or electric cars which reduced the emissions in the environment and caused less pollution. The innovation in this case is the use of an electric and scooter based taxi service. The Dutch taxi company offers taxi services using electric scooters. This is a cheap, fast and environment friendly service offered in the streets of Amsterdam. The electric scooters are an alternative way of travelling within the city from point to point and in this mode the travelling time can be reduced significantly since the electric scooters can weave around idle traffic jams. The tariff for a scooter taxi service is a flat 2.50 Euro (3.25 USD) and it runs in the city center of Amsterdam. Reports indicate a positive acceptance of this new taxi service. The green electric scooter taxi service is innovative in many ways and respects. It is amazing what people can think of and how many new innovations appear in the area of green energy saving and recycling in order to save the environment.